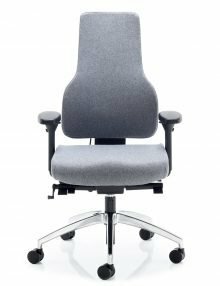 WE SELL THE COMPLETE RANGE OF GRAHL CHAIRS. PLEASE CONTACT US IF YOU CANNOT SEE THE CHAIR YOU REQUIRE. The perfect backrest has to fulﬁl two apparently contradictory criteria: It should not only support the upper body and take over the functions of the muscles which support the back; but also follow and facilitate the movements of the upper body. The resultant ‘dynamic sitting’ stimulates the muscles, helping to prevent back strain or alleviate existing pain. Just as importantly, this stimulation retards the natural build-up of muscle tension, helping to lessen the effects of tiredness. The unique split back pads of the ‘Duo-Back®©’ are positioned halfway between the top and bottom of the spine so that when reclined the lower sections of the pads move forward straightening the spine and pelvic girdle. This is a vital point often stressed by both back specialists and ofﬁce ergonomists. 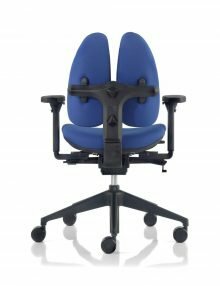 Height adjustable, the backrests correctly support the back of any person. The space between the pads allows the spine to move freely. Instead of putting pressure on the spine, support is evenly distributed throughout the back muscles. The backrests are pivotally mounted enabling them to move in all three axes – forwards and backwards; up and down and left to right. It means that the back is fully supported in all positions. 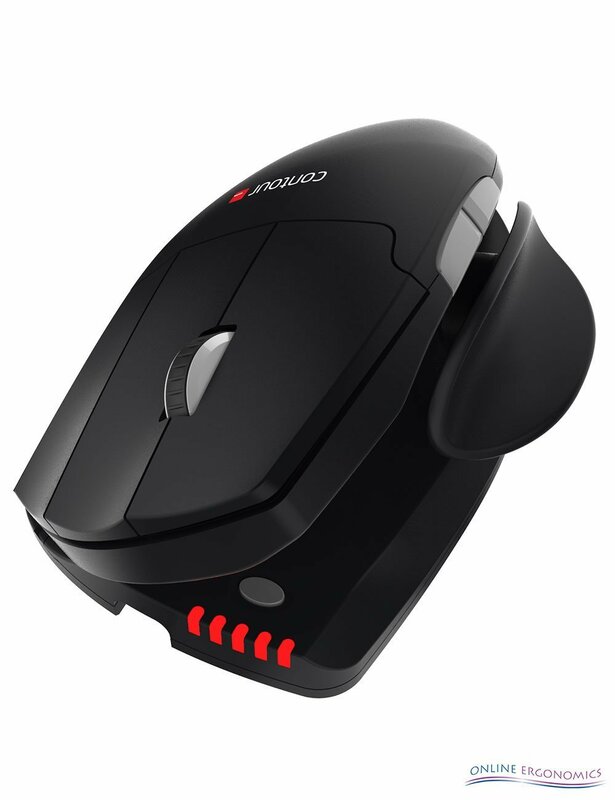 Uniquely, the mountings provide the back with ‘active support’. 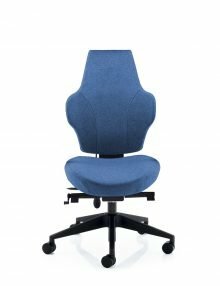 The shape and mobility of the backrests ensures that they follow the contours of the back as it moves, varying the support needed and stimulating muscle tone and blood circulation. Duo-Back®© is ofﬁce ergonomics perfectly applied. The perfect backrest has to fulfil two apparently contradictory criteria: It should not only support the upper body and take over the functions of the muscles which support the back; but also follow and facilitate the movements of the upper body. The unique split back pads of the ‘Duo-Back®©’ are positioned halfway between the top and bottom of the spine so that when reclined the lower sections of the pads move forward straightening the spine and pelvic girdle. This is a vital point often stressed by both back specialists and office ergonomists. The backrests are pivotally mounted enabling them to move in all three axes – forwards and backwards; up and down and left to right. It means that the back is fully supported in all positions. Uniquely, the mountings provide the back with ‘active support’. 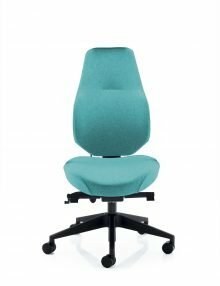 The shape and mobility of the backrests ensures that they follow the contours of the back as it moves, varying the support needed and stimulating muscle tone and blood circulation. Duo-Back®© is office ergonomics perfectly applied. 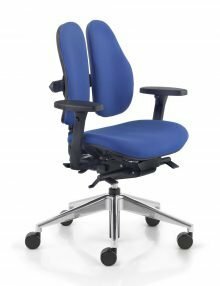 The Type 12 Chair includes all the standard Features as Type 11, but with Upholstered outer back rest pads. Gas Assisted Seat Height Adjustment. 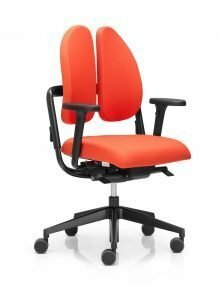 Multi-Lock Synchronous adjustment of seat and back rest. Easy reach weight tension adjustment. Patented height adjustable Duo-Back®© back rest pads. 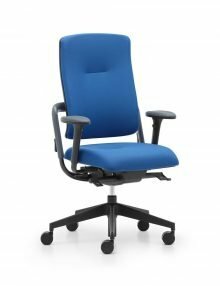 Upholstered outer back rest pads.